I've been continuing on a walk east through earthquake-damaged Christchurch, New Zealand. The City of Christchurch is a devout religious community with a hundred churches and hundreds of bridges. You can see as we continue to move eastward, there are more barricades, more backhoes, and more bridges that are a little damaged but still standing (it takes a lot of damage to close a bridge). The Church of Jesus Christ and Latter Day Saints (LDS) is on an island in the Avon River with two bridges. The first bridge is on steel girders and has a pretty white railing. 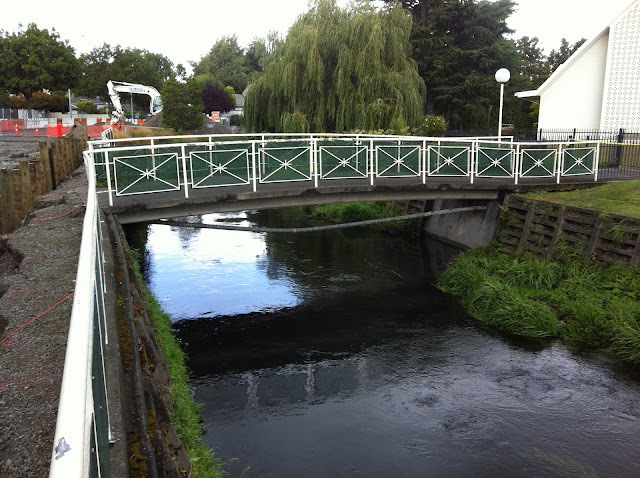 The second bridge has a black steel railing and it crosses the river just downstream of a weir. New Zealand's Bridges: Bridges to the LDS Church across the Avon River in Christchurch by Mark Yashinsky is licensed under a Creative Commons Attribution-NonCommercial-NoDerivs 3.0 Unported License.